What’s The Purpose Of A White Paper? While the exact format and style of a white paper varies between industries, in simplest terms, a white paper is an in-depth report that presents a specific problem, educates its audience about that problem, and then provides a solution. In the tech world, a white paper is typically used to present a new piece of technology or innovation that aims to solve a particular issue and theorizes how that solution will work. White papers may not be the most exciting form of writing, but they’re a necessary tool in certain scenarios, particularly when the solution being offered is complex or involves breaking new ground. As an extensive amount of research goes into the drafting of white papers, they also help establish credibility with readers who are interested in the project or technology being introduced. Unfortunately, not all white papers are created equal. Too many authors of white papers don’t understand what a white paper is meant to be; more importantly, they don’t understand what a white paper is not. That’s why, instead of authoritative, focused problem-solving guides, the cryptocurrency space is flooded with a hundred different white papers that use a lot of buzzwords but don’t offer much in the way of tangible solutions to real-world issues. That’s exactly what we don’t want our white paper to be. The problem we want to solve is very real and even life-threatening at times; our white paper should offer realistic solutions to match. It’s our belief that technology should be used to change people’s lives. That’s why we want our white paper to show the world we know our stuff and that we’ve put an extensive amount of thought into how to solve pressing issues of the LGBT community in an innovative yet achievable way using blockchain technology. We’d like the help of both the LGBT and crypto communities to make it happen. What Problem Do We Aim To Solve? In recent years, many societies have made great strides in regard to LGBT rights. But there’s still so much to be done. Even now, there are countries in the world where a person can still be put to death for having gay relationships. In others, laws are in place to actively discriminate against the LGBT community. Even in many of the most advanced nations, the road to progress for LGBT people is a constant struggle. There are a hundred different factors that account for discrimination against the LGBT community and we’re aware we couldn’t even begin to solve them all, nor identify every issue. 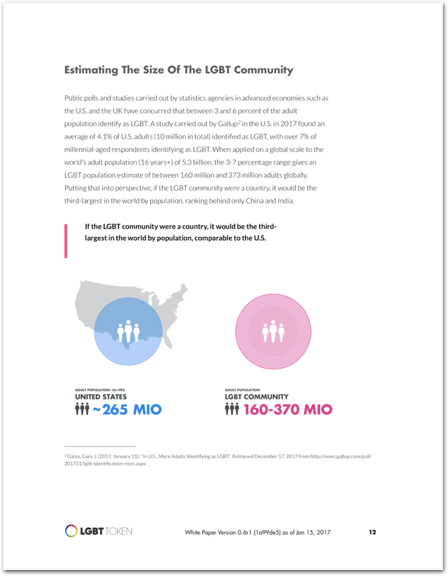 One issue we’re confident we can pinpoint and address, however, is how the pink economy has been underserved by the global economy and underutilized by the global LGBT community. Because of this, the global LGBT community has yet to truly tap into the enormous power it has as a collective to advance LGBT rights around the world. We know these are ambitious goals. Yet we wouldn’t be doing this if we didn’t truly feel blockchain technology can help improve the circumstances of the LGBT community around the world. For starters, with blockchain technology, a participant in any transaction has the ability to keep their identity anonymous. Keeping one’s identity private is a major and valid concern for the LGBT community, particularly in the aforementioned countries where it’s still a crime to identify as a member of the community. However, the benefits of using blockchain-powered solutions don’t end there. How Is Cryptocurrency Better Than Fiat Currency? Today, the majority of the world exchanges fiat currency, or your traditional paper-based monetary system. It’s worked this way for hundreds and hundreds of years, but as globalization has necessitated evolution in the way we approach major systems like business and communication, so too do our monetary systems need to evolve. Enter cryptocurrency. No centralized government control: Because of the decentralized nature of cryptocurrency (in other words, you own it, not a government), ownership is not consolidated in the hands of one government or entity. This safeguards against governments devaluing their own currencies or taking it away from you. Everyone gets access: Many people around the world lack access to fiat forms of currency or exchange models, but they do have internet and mobile phones. Cryptocurrency ensures that anyone shut out of traditional exchange systems can partake in the crypto-economy. Eliminates fraud & identity theft: Because of the digital and decentralized nature of cryptocurrency, it can’t be replicated or reproduced, eliminating fraud. Further, because control rests in an individual’s hands, they can share only the amount of currency that they want a merchant or vendor to have without having to give that vendor their personal information. This is in contrast to credit-based forms of payment, in which the merchant of vendor takes all of your information when debiting their payment from your account. More efficient charity organizations: Even the best charity organizations spend a fair chunk of their proceeds on overhead and the organizations themselves. With no middle man taking a percentage and no inefficient layers of transaction, cryptocurrency ensures that charity funds can be delivered directly to the people or organizations it needs to reach. As a cryptocurrency, LGBT Token would help reduce a number of issues facing the LGBT community, from keeping personal identities and information private to putting the power of a digital currency in the hands of those most marginalized by traditional systems. With the backing of Hornet, the world’s premier gay social app, and other launch partners to follow, we will establish the LGBT Foundation, which we strongly believe should become self-governing. The board of the Foundation will be comprised of members of both the LGBT community and the crypto community, who will oversee the implementation and running of LGBT Token. The beauty of having sponsors like Hornet and other launch partners with large, pre-existing user bases is that that are already participating in digital and app-based spending and earning models. By enabling such brands to do business with LGBT Token, we can build a huge economy for LGBT Token right into its organizational structure. Too many types of cryptocurrencies function as forms of payment only in theory; in practice, they never get spent because there’s simply nowhere to spend them and nothing to spend them on. For us, this is one of our main areas of focus. We’re determined to create viable ways to use the Token in the real world, online and in physical, brick-and-mortar businesses. Helping to accelerate is the fact that LGBT Token will launch with a robust economy already in place, with plans to expand it even further. In this way, we will provide a currency for everyone in the LGBT community who wants to participate, while making visible and growing the global pink economy. All of which leads to the puzzle piece nearest to our hearts: LGBT Impact. Every year, a portion of the Tokens released will be set aside to fund projects through the Foundation’s charity initiative, LGBT Impact. These projects have no set criteria provided they aim to support and advance the rights of the LGBT community, whether local or global. For example, LGBT Impact might help support LGBT community members running for political office to get fair representation for members of the community in areas where it’s missing. Or it might help evacuate gay men living in countries where they are in danger of being detained and persecuted for their sexual orientation. Or maybe it will help build the first transgender child-friendly playground so that transgender children can feel free and safe to be exactly who they are as they play. The possibilities are endless, as long as they support the LGBT community. Each quarter year, LGBT Token holders can suggest various projects to the Foundation for funding. The community will then vote on the candidates, with the number of individual votes being equal to the number of Tokens a person holds. The Foundation will determine the results of the voting, with funds from LGBT Token being distributed among the candidates in accordance to the number of votes received. This is how we aim to solve a problem and give back at the same time. We want to use the untapped might of the LGBT community to power and grow its own economy and then use that economy to address the specific needs of the community and help advance its status in the world. It’s a lofty aim, but it can be achieved. This is a complex issue involving two communities with little overlap. 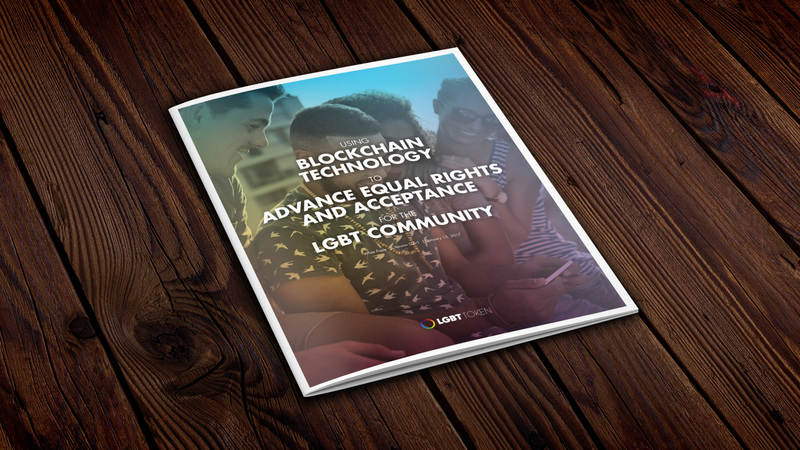 We’re currently in the process of drafting the white paper and we’ve already received an incredible amount of helpful feedback from the LGBT community. However, we welcome more. We also want to invite members of the cryptocurrency community to be part of this process. It’s a technical solution to a humanitarian problem, and know we can’t build the best version of this project without feedback from those who are experienced in the crypto world. What are the most pressing specific needs of the LGBT community that we can solve? Who would make a great launch partner or Foundation board member? Is our theory about the built-in Token economy valid in practice? And what legal cryptocurrency issues haven’t we considered yet? There are a number of questions to be answered. Finding the right balance between the two communities is of utmost importance, which is why we are offering an open call to action to join us in our mission. We don’t want to do this unless we do it right, which is why we won’t release the white paper to the public until we have the approval of both communities. Once the white paper has been released, we’ll also publish a pink paper that will dive deeper into the economic model and a yellow paper to explain the technical details. Clearly, there is work to be done. Whether you’re a member of the LGBT community, the crypto community, or a business or brand that’s interested in partnering with us, we invite you to get in touch. We are confident you’ll provide feedback we haven’t considered and ask questions we haven’t thought to ask. We know we can change the world, but we can’t do it without you. For more information about the LGBT Foundation and its mission, you can visit the LGBT Foundation website. To inquire how you might get involved with project feedback, simply fill out this form. LGBT or LGBTQ, LGBTQI or LGBT+ includes Lesbians, Gays, Bisexual, Transgender, Queer, Intersex, and other communities defined by their sexual self-identification. We celebrate the spectrum of diversity as well as gender fluidness and will work to support and include + elements through the efforts and makeup of the foundation. We understand that some cryptocurrencies are only pseudo-anonymous, while others have implemented sophisticated means to ensure anonymity. Our aim is to make LGBT Token wholly anonymous.